We woke up to a beautiful sunny morning in Antalya in a beautiful quaint hotel in the old town Keleici. Our hotel room gave us a great view of the town (below) with Kesik Minare sticking out of the old houses around town. Kesik Minare, which means Cut Minaret, was the remaining of a minaret of a Roman temple, which was eventually converted to a church. We planned to spend a day walking around the Roman town the next day. We joined a day tour to the Mediterranean coast town of Myra that includes a tour out to the Mediterranean Sea. We were supposed to join another tour to Perge and Side, but were given a chance to change it to this tour. Of course, we took the opportunity to take a cruise in the sea! We were driven along the coastline with beautiful views of the sea before reaching the town Myra. Myra was an old Roman city, with many Lycian tombs on the hill. 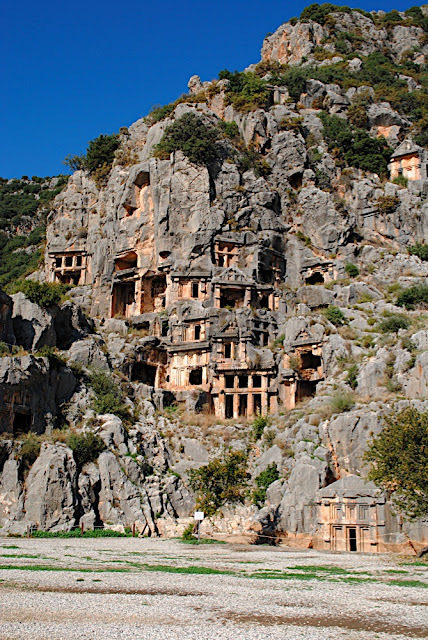 They were tombs by the Lycian people, carved out on the rocks in the shape of houses. According to our guide, there would be a table inside the “house” where they will put the body of the dead. When there are another death in the family, they would then return to the “house”, clear away the bones and other remains, and leave the other body on the table. It was definitely an interesting sight. And again, you need a Roman theatre to complete a Roman town! There were several carved theatrical masks lying around the front of the theatre. St. Nicholas of the Santa Clause fame was a bishop in the town of Myra. There was a church named after him, the Church of St. Nicholas. To this day, many Russians would take annual pilgrimage to visit the church and the sarcophagus that was said to contain his body. The bones in the sarcophagus had long been taken away out of Turkey. 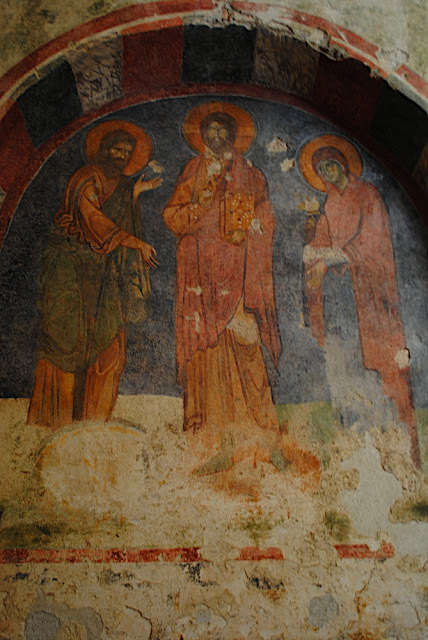 It was a relatively small church, but has many frescoes that has been restored (probably not to its former glory). Next up was a cruise out to the Mediterranean Sea. The weather was perfect, making the already picture perfect views even more amazing. We cruised by (relatively quickly I have to say) the sunken city at Kekova. The Sunken City, called Batik Sehir, used to be a small city on an island. However, several earthquakes during the 2nd century moved and sunk the whole island. There were no more inhabitants, only some odd little goats, left by their owners to feed before bringing them home. We could see some of the remaining structures on the island, as well as some pieces of home essentials at the bottom of the sea base. The boat passed by Kalekoy, a town built on a hill by the sea. There were some sarcophagus on the sea and hill around that area. I was not sure if they were all once on the hill, and the earthquake brought them down on the sea, or has it always been built on the sea. Wasn’t it weird putting a coffin in the sea? 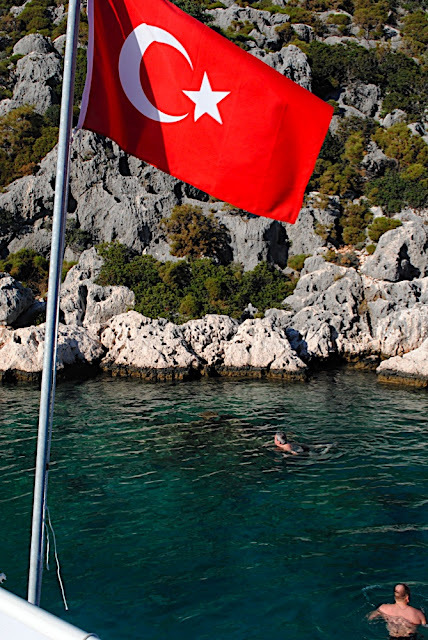 The boat then stopped for our fellow boat mates to take a swim on the Mediterranean Sea! The water looked clear and clean, and we took opportunities to snap photos all around with beautiful sea, sun and land. After a long day out, we made our way back to Keleici for a rest, before another day of fun the next day! From a small island, Penang, Malaysia and currently living in a slightly bigger island, Singapore. A working mother of 2 beautiful girls who loves to travel. These are my reflections on my travels (and everything else that I love).